RIM's introducing BlackBerry Protect, a new feature that lets users wirelessly backup, restore, and locate their lost BlackBerrys for free. Basically your already very secure BlackBerry will be even safer. And you didn't have to pay a penny. 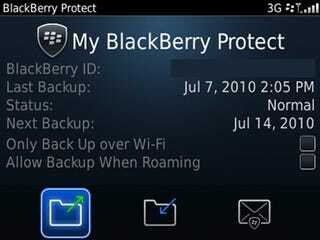 BlackBerry Protect allows you the ability to wirelessly backup, restore and locate your BlackBerry® smartphone. In the event that your BlackBerry smartphone is misplaced, lost or stolen, BlackBerry Protect provides features like: remote device wipe, remote device lock, ‘Lost and Found' screen, locate device on a map, remote activation of the BlackBerry smartphone loud ringer, and wireless device backup and restore.